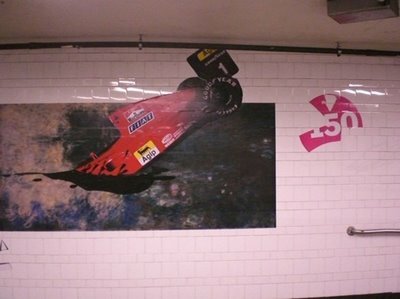 This seems to be the only commentary I've found on the PosterBoy, MoMA mashup that happened a few days ago at the Atlantic/Pacific train station in NYC. Mr. Gould's initial response to the MoMA installation is expected, yes it's clearly a publicity stunt and yes it is equivalent to an advertisement in every way. 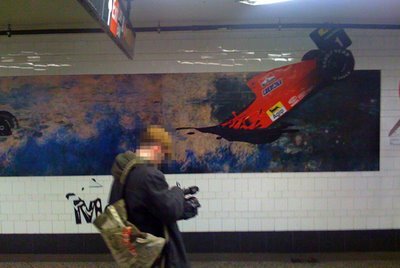 That said, it is expected PosterBoy would find his way to this station to call attention to this fact by treating the work the same way he has treated advertising throughout the subway system. Mr. Gould's final remark about the connection between PosterBoy and Doug Jaeger turning this into a publicity stunt instead of a well guided attempt to continue along an artistic trajectory set nearly a year ago by PosterBoy, does not sit well with me. On some levels I agree that this wreaks of a partnership where both parties are clear about what they will gain from the stunt and are taking advantage of an opportunity. On another level I am aware of more of the back story than I think Mr. Gould is, and thus realize what an amazing opportunity for PosterBoy this was. The Atlantic/Pacific station is heavily trafficked and nearly impossible to hit. Without Doug Jaeger's participation this project probably could not have happened. So as an artist, PosterBoy is in a strange position. By doing the project he is able to continue his work in an interesting way by leveling MoMA's art advertising stunt and thus comparing it to the regular advertising you see. He is also able to draw attention to his project on an unprecedented level, thus gaining momentum for what he hopes will be a strong investigation into who controls public communication in the public environment. The only thing he has to do is team up with someone involved with the MoMA project. Remember MoMA had nothing to do with this stunt. And so the question remains. Does aiding a PR firm while moving his own ideas forward become caustic to his project as a whole? My initial reaction to the MOMA installation at Atlantic Ave. was mixed. I concede that people are inundated with advertising, and this was an opportunity to offer people something more cultured. Still, the motivation seemed a little suspect. Seeing Poster Boy and Aakash Nihalani, however, remix the works made me very excited about the installation. While the public display makes the work vulnerable to vandalism, it also provides for the images to be appropriated and enter the larger cultural dialogue. It, therefore, brings a new life to the pieces and provides for more social commentary. What I don't quite understand in this story is why Doug Jaeger, the advertising brains behind the original campaign, was photographed participating in the vandalism? The move reduces Poster Boy's street art to a publicity stunt. This makes the project seem calculated and doesn't bode well for the MoMA or Poster Boy.